As we end what has been a beautiful month of September in Santa Fe, it’s time for us to look forward to what fall has in store for us this year. It is often said in travel circles that the best time of the year to visit Santa Fe is between September and November. During these months, the temperature is mild and enjoyable, the streets are less crowded, fall colors begin to show their vibrant hues, and the City Different becomes an even more affordable fall destination. And of course, we couldn’t talk about fall in Santa Fe without mentioning the fantastic fall festivals that are happening, too. No matter what it is you’re looking to do this fall, book your room at our luxurious Bed and Breakfast Inn, and see for yourself why Santa Fe is the perfect fall destination. The colors of fall in Santa Fe are as distinctive and beautiful as they come. While many, when they first hear of fall foliage, think of the vibrant reds, oranges, and golds of Maine or Vermont, let us assure you that the colors of Santa Fe are just as stunning, when the native trees change into the deep crimson and golds we usually reserve for sunsets. There are a tremendous variety of hiking opportunities to suit all fitness levels in Santa Fe, all with different but equally rewarding views out over the stunning colored mountains and valleys. 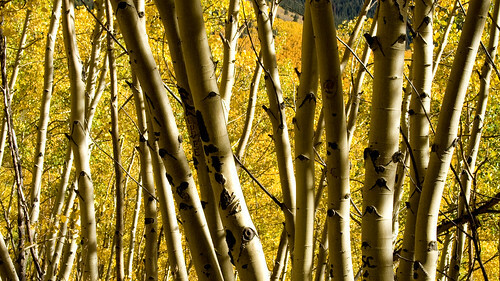 As its name suggests, Aspen Vista in the Sangre de Cristo Mountains is a great place to enjoy a 360-degree panoramic view featuring our distinguished golden aspens. Another popular hike in the area is the Atalaya Mountain Hiking Trail, which features great fall views of the Rio Grande Valley. If you want the views without all the work, then take a drive up to the Santa Fe Ski Basin, where you can get on the Santa Fe Ski Quad Lift, taking you to soaring heights and a stunning view of the area. While the beauty of Santa Fe during this time of year is worth seeing, there are so many other reasons to make Santa Fe your fall destination. During no other time of the year will you have such personal access to the artists and artisans famous to Santa Fe, than in October during the Canyon Road Paint Out. It’s a great time of year to explore Santa Fe’s art scene, and likely even find a new piece of work to take home with you. Other fun fall events in Santa Fe include the Santa Fe Independent Film Festival, the Harvest Festival, the Galisteo Studio Tour, nearby Albuquerque’s International Balloon Fiesta, and many other great events. To complete your trip, be sure to sample some of the delicious green-chile based food around Santa Fe, too, because autumn is harvest season for these local favorites. For these reaons, and so many more, Santa Fe is the perfect fall destination. Book your room at our luxury Santa Fe Bed and Breakfast today, and fall in love with Santa Fe.